When I showed up to the Mikulak house yesterday, the kids had just come home from camp and were watching cartoons on the couch. 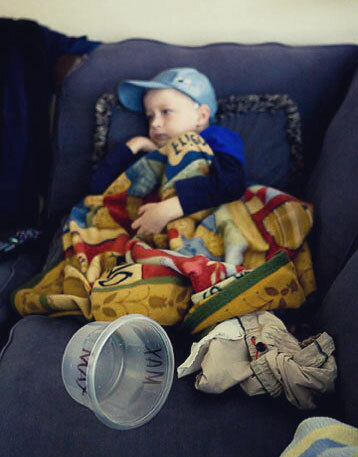 One thing that I've noticed is that Max's throw up bowl (tupperware bowl with his name on it) seems to always be by his side and when it's not, he asks his Mom to go get it. Also note his special couch blanket. Kitty no. That stays outside. I go over to see what Naboo has and this lizard comes wriggling towards me (I hate bugs, lizards, etc.) and I end up jumping on the table...literally. Max came running to see what Naboo was up to too. Seeing what Naboo had done and watching his Mom chase around the lizard with a paper towel in hand made Max laugh. Melis caught the lizard and threw it back outside. Then I tried to get a photo of Max with Naboo but Naboo had other things on his mind (most likely catching his next lizard). Then the hospice nurses arrived to change Max's button (g-tube), which has been leaking, and to access his port for lab work. Melis decided that the best place to do it was in Max's bedroom. 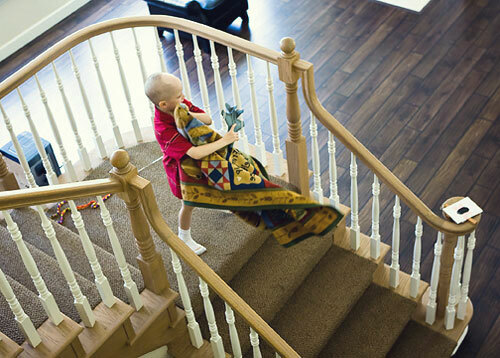 Max has trouble walking up the stairs and needs Mom's help. 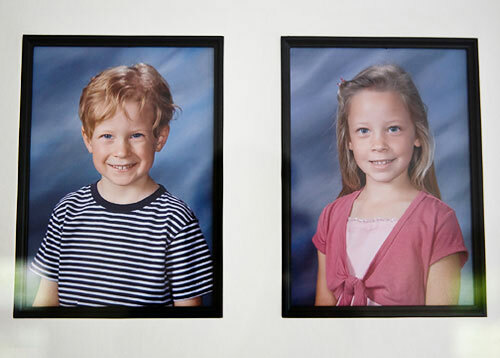 At the top of the stairs is an entire wall of Max and Hannah, beginning at about age 2. (Nicky hasn't quite made it to the wall yet). This is one photograph on that wall. Not sure what age Max is here. This is the hospice nurse talking to Melis and Max about what she's going to do. She kept trying to talk to Max, asking him questions, but he wasn't much up for answering. I'm sure he just wanted her to do her thing and get it over with. The nurse showing Max his new g-tube. And then it was time for the g-tube swap out. The nurse removes the water that is inflating the g-tube balloon, which holds the g-tube securely in place. She removes the old one and puts the new one in the hole. And then inflates the balloon. It all happens very quickly and seems to be with no pain. I thought it was neat that the nurse talked to Max a lot about his g-tube and asked him if he wanted to see the old one. He was pretty excited to see it. She also let him see what it's like with the balloon filled. Melis said that in 3 1/2 years of having his g-tube, he never got to actually see one. Then it was time for the port access, something Max doesn't like. Mom helps him get his shirt off. And the nurse prepares her equipment and talks to Max about what she's going to do. At one point, Mom had to step out of the room for a minute and the nurse was talking to Max. I think she said that she had everything ready and Max said, I just need to hold my Mom's hand. I just need my Mom. She said she would never start without his Mom being there. And then it was time to access Max's port. About 30 minutes prior, Max had a cream put on that numbs the area a bit. I'm not sure how well the cream works but I know it's used a ton with kids. Max never likes his port being accessed but Melis said that he reacted a bit worse than usual yesterday. After the blood draw, Mom asked Max if he wanted a band-aid. Yes, he wanted sponge bob. After everything was done, what did Max want? One of his airplanes, of course. I think it was an F-15, to be exact. It's hard for me to comment on photos (other than describing the moment) or even share my thoughts in general, as I worry about not saying things right or offending someone. But, one thing that I've been thinking about is how we hate to see our children in the hospital or in pain once a year, once every couple years. These parents often see their children in pain or in the hospital numerous times a week. I just can't imagine. I know you just do it. You do it...you remain strong...for your child. You hope with everything you have to hope with. You fight with everything you have to fight with. The Mikulak family will be at Disneyland all next week. 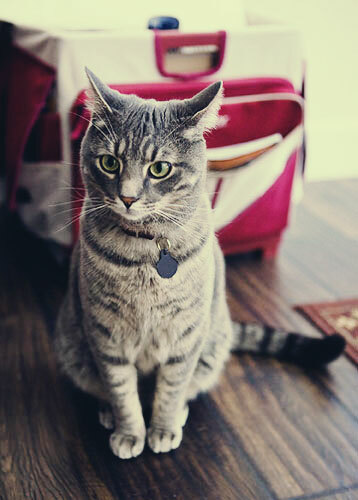 The next time I shoot Max will be next Sunday, when I'm going to do a formal family session for them, at the beach. I have been encouraging Andy and Melis to do family photos for a while now and glad that we are finally going to do so. Such powerful photographs ... they capture so many emotions. And your captions are also so descriptive. My eyes are filled with tears right now ... Max and Melis, you are so strong, so inspiring. Thank you all for sharing your lives with us. I am trying to come up with something to say but once again I am without words just lots of love and prayers for you all! and off he went.. Deb the F15... Max going down the stairs.... He is my Hero! Thanks for keeping me focused on who we are and how we use Media. Deb, you are so amazing for having the strength to bear witness to this battle, and that little man Max and his family are in my heart and hopes. I just spent an hour reading the blogs and sites - your images are just stunning in both their content and their emotion. It's amazing artistry, and such strength to see it and not look away because of how much the unfairness of the struggle makes our hearts hurt. I am so in awe of the love of the parents who walk the path of illness with their children, and of those amazing lights of pure kid-ness that shine so bright, past all of the awfulness of being sick. Thank you to you, to his family, and to Max, and blessings. as someone who has watched the journey and battle with cancer up close and personal, i want to HUG YOU and sing your praises endlessly for your beautiful documentation of the good bad and ugly of max's journey. these images are INVALUABLE and so very powerful! I've been following this for a while, I have neuroblastoma like Max. I was diagnosed atage 5, NED at 8, relapse at 17...still fighting and I'm 19. Your photos are amazing. They really capture a good portion of what living with cancer is like. What about a photoshoot at Max's next scans or something? Anyways, thank you. I look forward to more pictures everytime I see them. The pictures are amazing...touching, sweet & sad all at the same time. As always, I can barely see through the tears in me eyes. Thank you for sharing. I wish I had a miracle for Max to make him "all better." I just can't imagine what the family is going through. I've followed a lot of websites of kids who have battled cancer. My heart has ached numerous times for them all but seeing these photos gives me even more empathy. Thanks again for sharing what Max has to deal with in his day to day life. The visuals really help to explain things to our kids...his friends. Deb, will you let the family know that we are keeping up with the blog and thinking of them? Angel HATES having his g-tube changed... Its one of his least favorite things. And his never looks that good coming out! LOL! Fortunately, a broviac/central line doesn't hurt to be accessed. Going through so much ourselves here... Day 22 of the hospital and truly no end in sight. Knowing that they know the battle and the fears brings tears to my eyes. And in this time of survival, I don't cry that much. Thank you for what you're doing for Max and his family. Our Love, prayers and faith is with you all, We ask for comfort for Max during this tremendous healing process. Deb, the pictures are so powerful. Thank you for sharing this painful battle for recovery. For more about Max Mikulak, visit his blog here. Max was born on June 30, 2001. 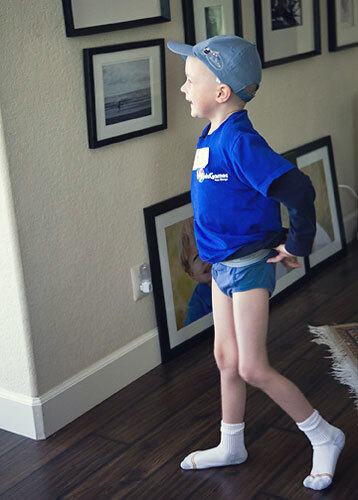 He was diagnosed with stage IV, high-risk neuroblastoma in October 2004. He whizzed through frontline treatment and by the following summer was effectively on the road back to a "normal" life - albeit with almost total hearing loss, a new immune system, and about 10lbs to gain back, all courtesy of Mr. Chemo. Unfortunately, Max relapsed (as most high-risk NB patients do) in November 2006. Max fought bravely, entering a clinical trial in Vermont where he received nifurtimox in combination with other chemo agents. This combination diminished the disease until there was just one tiny spot still evident on his spine. But in February 2008 the beast came roaring back and we could never control it again, despite everything we tried. Max passed away on August 31, 2008 at 8:45pm in his mommy and daddy's bed.